Let’s face it: Part 1 was a tough act to follow. It was fresh, accessible and exciting – nothing like it had been seen before. But Part 2 was a good follow up, not least because this time little Gobbolino made it to the front cover! Nigel Lambert, Brian Blessed and Sheila Hancock were the featured readers. Lambert narrated three stories, and he would go on to become one of the most regular readers throughout the partwork’s run. This issue had a couple of “firsts”. It had the first poem (the lively Bring on the Clowns) and the first Arabian Nights adventure (Sinbad and the Valley of Diamonds). 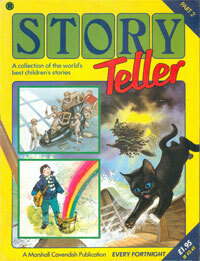 Most later issues would contain a poem (in Story Teller 2, poems were always placed on inside back covers). Similarly, further tales from the Arabian Nights would grace the pages of Story Teller. Early favourites Aldo and Gobbolino continued their exploits in this issue. The Oriental tale Master Tiger, the fable The Greedy Fox and the present day story of the Last Slice of Rainbow made up the rest of Part 2.